I’m really excited to say that I launched my new book How I Independently Publish Picture Books this week! The book is available as a downloadable PDF on Etsy and as an ebook on the Kindle Store and tells you all about my own path to indie publishing my stories. I’m entirely self taught and it has taken me several years to learn about the different steps and processes that are required to publish. I hope that sharing what I’ve learnt will help you to have a go at publishing your own picture books too. I see the book as an ongoing project so please do get in touch and let me know what you think and if there’s anything else you would like to see included. Angel's Great Escape's 2nd Birthday! Two years ago today I released my first picture book into the wild! Angel’s Great Escape: A Christmas Story was an absolute labour of love for me & I did everything I could to get it published. It was an animation script & an app before the story became a picture book. I taught myself how to independently publish, worked with fabulous illustrator Kristyna Litten, learned from my brilliant book designer Sarah & muddled my way through the processes of CreateSpace & now KDP. It’s been a brilliant journey & I love knowing that each Christmas children will pick up my book & it will make them feel cosy & Christmassy just as The Story of Father Christmas by Ann & Dennis Mallet made me feel when I was little. Thank you for buying, sharing & reviewing, it really means the world to me. While I put the finishing touches to the wording of my new ebook, I wanted to share a glimpse at the cover with you. I use a similar image to this for all of my social media for And So We Begin and it felt right to use it to illustrate an insight into my journey so far. I hope you like it! The book will initially be available as a downloadable PDF in my Etsy shop but I’m working towards popping it on Kindle too. I have a couple of readers giving me feedback and I’m adding a little more text and some more images. I’m still planning to release the book later in October so if you’re intrigued and you’d like to be the first to hear updates, please sign up for my newsletter on the home page of my site. This week I've been moving on to the next stage on my journey of independently publishing picture books and have switched my printing process from Createspace to Kindle Direct Publishing or KDP. Joanna Penn has been talking on her podcast recently about how Createspace is due to close down and recommended moving over to KDP. As my ebooks are already published on Kindle this made sense to me and means that my books are in the same place (with the exception of iBooks). I looked for advice online to show me how to complete the process and found this very helpful video which describes the steps clearly. It was super easy and took minutes. Once I'd received the approvals from KDP, I ordered a copy of each book to have a look at the print quality. I chose the gloss cover and matte pages and I'm really pleased to find that the finish is exactly the same as Createspace. I also love the fact my books are still print on demand which ensures I am not being wasteful and saves me from having an apartment full of boxes! Switching will also hopefully allow me to be seen more easily on Amazon by using their marketing services. I’m excited to see what effect this will have on my sales and will write more about this in a future post once I've experimented a bit! As an independent children's publisher, I've had to navigate a lot of the journey myself. I've spent many hours trying to fathom out design and print processes and working out how to get my books listed and seen alongside traditional titles. I'm very passionate about my creative projects so have been interested to understand every step of the process and I feel a great sense of achievement (and relief!) when I work it out bit by bit. It can, however, be a bit of a lonely world. So it was fantastic to see that The Creative Penn recently released a podcast on the subject, an interview with Karen Inglis who has been publishing her own children's titles for the past seven years. I was particularly interested to hear how Karen has been using Amazon Marketing Services to boost her sales and to help her titles to be seen alongside traditional publishers. When I started this path, I remember asking a speaker at a self-publishing conference how I could distribute my own books and at the time, it just wasn't possible. It's amazing to see how far things have come in less than 10 years. Self-publishing books for children can be challenging because of higher printing costs and difficulties in marketing to your target market. In today's show, Karen Inglis explains how she sells thousands of copies of her books for children and tips for how you can do it too. I'm really pleased and excited to announce that An Amazing Alphabet of Cake is now available to order from Waterstones. It's been such a learning curve working out how to get the book into shops so this feels like a real milestone. Only a few years ago, there wasn't really a route for independents like me to be seen. And now, thanks to Ingram Spark, I've been able to upload the book to their system and it's now started to become more visible across book stores online. My next step is to approach Waterstones with a copy to see if they will hold stock in their bricks and mortar shops. It's so lovely to see something that was once just a spark in my mind existing out in the wild! Although I've been to the London Book Fair a few times before, today was my first visit as an illustrator and I have to confess I felt a little nervous! Although I share my illustrations online, I rarely share them face to face when I can actually see an immediate reaction. I spent some time last week printing out a selection of my latest drawings to create an up to date portfolio, packed up some copies of my books and some postcards to give to people and set off. I started the day by attending some seminar sessions, followed by a good browse around the stands and then spent the afternoon in the Children's Publishing area listening to art directors and having a one to one portfolio review. I thought I'd share a few notes on what I learnt today. 1. A lot of the fair is about the business of books. It's a great opportunity for the industry to get together to have meetings and network in one place, which means being new to it can feel a little intimidating. People are rushing everywhere keeping to their schedules while you wonder round wide-eyed. Most of the big publishers have huge stands with lots of tables where colleagues and visitors are talking intensely. It's helpful to know that approaching stands to speak to editors or art directors on spec may not work as appointments are often pre-planned. However, the majority of publishers I spoke to were very happy for me to leave samples and to chat about their submissions policies. 2. Head for the area that is relevant to you. The fair is split into sections, Authors HQ and the Children's Hub for example. The floor space is huge so wear comfy shoes, allow plenty of time to get from A to B and spend a little time studying the map to ensure you know where you're going. Give yourself breaks and try not to worry too much about what everyone else is doing! 3. The Insight Seminar Programme is brilliant and worth the entry fee alone. As I'm relatively new to publishing I am still learning a lot (!) and the fair runs almost 200 conference sessions about all manner of subjects with a whole host of experts. The timetable is published on the fair website. Today I joined sessions about demystifying book distribution with Ingram Spark and getting started with Kindle Direct Publishing and I also listened to a presentation about book PR & Marketing. Most sessions are about 45 minutes long and importantly the speakers are always very available for questions both during and after their session. 4. Take opportunities. When I was reading about the fair a few weeks ago, I noticed there was an Illustrator's Afternoon taking place in the Children's Publishing area, which included the chance to have your portfolio reviewed by an art director. After being so absorbed in independently publishing An Amazing Alphabet of Cake I thought it would be really interesting to be brave and to get a professional opinion on my work so I booked a slot. I met with a lovely lady, Strawberrie Donnelly from Scholastic, who gave me some really helpful and encouraging feedback and advice. Although I am really enjoying working independently, I also love collaborating on projects and it was great to investigate a little about whether my style is going in the right direction to make that possible. If you are an illustrator, I would highly recommend making a note to sign up for a portfolio review next year! 5. As a writer and illustrator I also love the fact there are some wonderful opportunities to see authors being interviewed. I didn't have time to go along to any today but enjoyed an impromptu brief speech by Author Of The Day Joanna Trollope who addressed the crowd of writers who were gathered at Author HQ. Joanna talked about how important failure is and how it is just part of your story. She also spoke about her process and how she loves to note down all sorts of things about people all the time. A turn of phrase, what people choose to wear and what that says about them, small habits people have, even things like what art they like. Joanna mentioned that she feels like, "Fiction is where we learn more about life than anywhere else..."
I hope you get the opportunity to visit the London Book Fair, if not this year, in the future. If you have an interest in books from any angle, it really is a great place to learn and to enjoy the company of people who love stories just as much as you do. (Fondant) fancy a different kind of sweet treat this Easter? My book An Amazing Alphabet of Cake is available now on Amazon! Cute little cake stickers are available in my Etsy shop. And fondant fancies are available in all good supermarkets - obviously I had to buy a box for the photo and didn't* eat them all. This weekend marked the beginning of picture book number three. I'm not going to reveal the concept and title just yet as I'm still playing with it but I have started sketching. And it feels exciting! The first thing I do with a book idea is think about how the words and illustrations will fill the book. Is the idea big enough? I use a fresh sketchbook for each idea and first write down the proposed wording and split it into 26 sections that feel right. Bearing in mind good moments for page turns and how illustrations may fill the page or whether they may be across a spread or just a spot picture in the middle. I then start sketching, very roughly, using one page of the sketchbook to represent each page of the book. This gets my creativity flowing, a bit like free writing. Nobody really sees these pages so they are messy and simply to get the idea for each picture started. I then switch to digital drawing in Photoshop when I feel ready. While doing this I am bearing in mind that most picture books are 32 pages but this needs to include end papers and the title page. The advantage of independently publishing is that you can play with this convention a little bit but you do still need to stick to multiples of four because of the way printers work. I am working on a 'how to' guide which will include everything I have learnt on my journey so far but one of the important things is that print on demand via Createspace or Ingram Spark will always need to include a blank page at the back of your book where they put their barcode and reference code. I think this helps them to match the pages with the cover in their print factories. It isn't too noticeable in a novel but really stands out in a picture book and takes up valuable space. So don't be caught out by this requirement and make sure you include it in your maths! Below is my first digital sketch for book number three. On the left is the sketch from my sketchbook - it's actually unusually tidy for my first attempt! 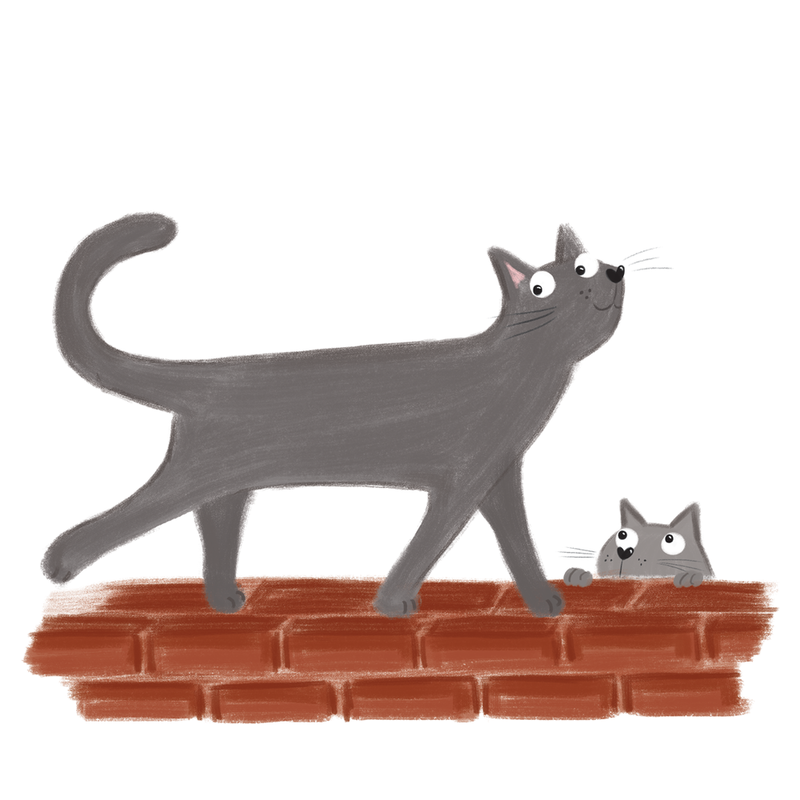 These little cats will appear somewhere in the middle of the book but they captured my imagination so I started drawing them first. This is unlike me. With An Amazing Alphabet of Cake I worked religiously from A to Z but without the structure of the alphabet I feel I can be a bit more free. I was pleased with the expressions on the cats' faces in my initial sketch and was worried I might lose this in the digital version. It still needs work but is getting there. I really want the cat on the wall to be a tabby so my next challenge is to see if I can make some stripes work on him. It feels fantastic to be drawing again. Almost like coming home. Having published two picture books already I feel the process is becoming more familiar. I know what I can achieve and it spurs me on to take little steps, even when it feels like a mountain ahead, knowing that one day I will be holding book number three in my hands and starting on book number four. This week I received my first confirmation of sales figures for An Amazing Alphabet of Cake from Amazon. The numbers may be modest but I'm so chuffed that people are buying and enjoying the book. Lots of friends have been sending me photos and videos of their little ones reading about cake. One of the little poppets is even trying to eat the cake from the page : ) Every review and note I receive makes me feel a little bit emotional and encourages me to create more. Thank YOU. Putting your work out into the wild and hearing what people think about it can be a nerve-wracking experience! And it can also be really wonderful. This week, we have received not one but two lovely reviews for Angel's Great Escape from book bloggers Read It Daddy and Being Mrs C. I always wanted to give children the same feeling I had when I read picture books and hearing how little ones are enjoying the story on the lead up to Christmas really does make it all worthwhile. We snuggled down together for another enjoyable read through. The print version is sublime, and definitely belongs on our Advent Calendar this year. Read the full Read It Daddy review here. Written in rhyming text it’s lovely to read out loud when all snuggled up together and the accompanying illustrations are gorgeous, really bringing the story to life. It’s a definite must read in our pile of Christmas books. Read the full Being Mrs C review here. So after a year of sketching, illustrating, proof-reading, designing, tweaking and tidying, it's finally here! An Amazing Alphabet of Cake was published on Thursday 30 November. A very special date for me as it would have been my Dad's birthday. The book is inspired by an A to Z game we used to play on car journeys. A game I still play often with the little ones in my life. This time last year, I sat down in a cafe with a sketchbook and set myself the challenge of coming up with 26 ideas for 26 pages of a book about an alphabet of cake. I loved the idea of my second picture book coming from something that was so close to my heart. I scribbled anything that came to mind, brainstorming words that might work, remembering cakes that the little ones had come up with when we had played the game. I slowly started translating my thoughts on to Photoshop, one letter at a time, sketching and layering, trying out different colours and building the illustrations slowly but surely. As I've mentioned before, I only started drawing about three years ago. Creating this book has given me a project to really practise with. Working independently has meant I only have my own deadlines to work to so I fitted drawing around my day job. Slowly ticking all the letters off the list. By June I had drafts of all 26 pages and was ready to start working with my book designer. I had worked with Sarah Goodwin on Angel's Great Escape so knew we worked well together. Although I had figured out the composition of most of the pages, Sarah helped so much by suggesting fonts, tweaking the palette to ensure consistency and creating the files in InDesign ready to publish. I also engaged a proofreader to check through the wording for me. She really helped by suggesting edits that would help the rhythm of the text. I absolutely love working with my small team. I love the independence of being able to make our own decisions. I love how I can quickly tweak an image if I need to. Although this is the second picture book I've published, it's the first one I've illustrated and I'm very much feeling my way. Seeing the reviews start to come through on Amazon, seeing how the book is resonating with people, really makes me happy. I'm already starting to sketch book number three. Building my tiny empire one picture at a time. "What a brilliant book. Beautiful illustrations, very quirky, and would keep a child entertained for ages, whilst learning their alphabet. A great stocking filler too. Highly recommended." "This book is such a sweet treat (pun intended). The characters are full of life and mischief and you basically want to sit with them and join in the fun. Inventive, colourful and joyful. Each turn of the page brings a smile. Wonderful!" "What's not to love? The joy of choosing your favourite cake without the guilt of the calories. Such a beautifully illustrated book and one that I'm really looking forward to sharing with my young nephew". Introducing An Amazing Alphabet Of Cake!